About a year ago I got it into my head that I wanted to get back into woodworking in earnest. I had, for a time, been working ad hoc in my shed one small project at a time. The table saw was sometimes a work table, the router sat in a box in the corner. The bandsaw was in my garage, but it was behind so much stuff I had inherited from my parents’ house that I couldn’t see it. The only place I had to work was a little 4′ x 3′ table I had built onto the wall for working on instruments, soldering amplifiers, and general tinkering purposes. My garage was a mess. I wanted a clean, well-lit surface upon which to work and I got it in my head that I would build a “workbench.” What I built was a table of the homely, utilitarian sort. It was (and still is) about 4′ x 6′ and about 42″ tall. It is a frame of 2″x 6″ lumber, bolted to 4″ x 4″ legs with a sheet of 1/2 birch plywood screwed down to it. I think, all total I had about $40 in it. A few months later I added a second-hand vise to the face when I got my first jack plane. And there she is in all her glory. I think it may be time for an updgrade. The problem with this particular bench is that while it is a clean, well-lit surface to work on, it is not a workbench designed for hand tool work. Not even remotely. It moves with every swipe of the plane, it shakes and shimmies and rattles when I chop out dovetails. It has done it’s best, but really it’s like asking a handkerchief to serve as a parachute. It may be the same shape, but it’s not the same thing. Admittedly, at the time I had no idea I would be making the transition into hand tools. I basically wanted a flat surface that I could spread out on and work. I knew I was going to try building an acoustic guitar and this seemed like the perfect solution. 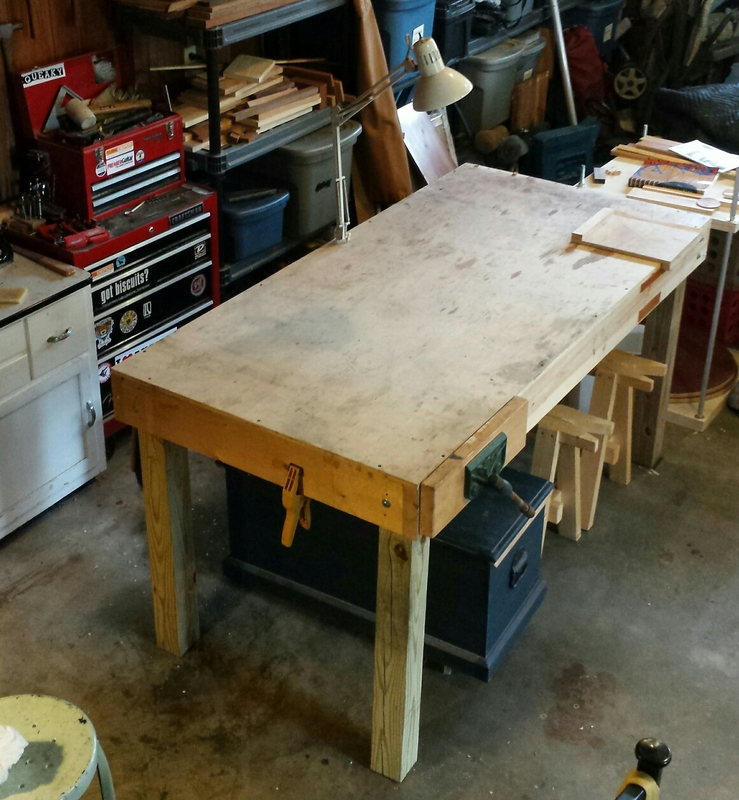 It has served beyond measure, and now I’m thinking about building a proper workbench for hand tool work. I think I’ve made a decision that has been serendipitously reinforced by the last issue of Popular Woodworking that landed in my mailbox. There are a couple of reasons that this bench appeals to me and I hope to enumerate them over the next few posts here on The Daily Skep as I work through some design questions, but as I’m finally entering into the finishing stage of the guitar build (which includes a lot of hanging to dry and not a lot of sitting on my workbench) and I’m finishing up Christmas presents for friends and family, this is definitely next on my list. Ha! Absolutely. I could have really been convinced either way, hut I hope to spend the next post or two talking about what tipped the scales. I certainly wouldn’t kick a beautiful French bench out of the workshop for eating crackers. Excellent, I’d love to hear how your bench build goes. I like working alongside other craftspeople (even if it is virtually). I too am considering replacing my “bench”. Mine was concocted from a handy piece of 1″ plywood I inherited when I bought this house 35 years ago. I made a frame from 2 x 1-1/2″ timbers taken from the roof structure of a dismantled garage and used for the legs as well as the rails. The frame is braced with a blockboard and plywood cupboard built around the rails. Having now built a ‘proper’ tool chest, the cupboard sees less use. The problem with a plywood bench is that you cannot ‘flatten’ it, or clean it up. I am favouring the English style with a tool well, but I don’t like the apron which gets in the way of using clamps. Yes, I have three holdfasts which I will be using (they don’t work well in 1″ of plywood! ), but old habits die hard and I use clamps a lot. I will watch your bench series of posts with great interest! Thanks for sharing both your inspirational work and your thoughts. I’ve got a few thoughts about that apron to share in the next post or two. I’ve got my heart set on building an oak Roubo in the next couple of years, but in the more immediate future is a 4′ knock down Nicholson for use as an assembly bench and for use at woodwork shows. The KD-N looks like a good solution for your shop, Jim. Look forward to following your build (as always). Not sure why but I love bench blogs. I’ll be watching for the next posts in anticipation. I really want to build myself a French model but I’m in no rush yet.